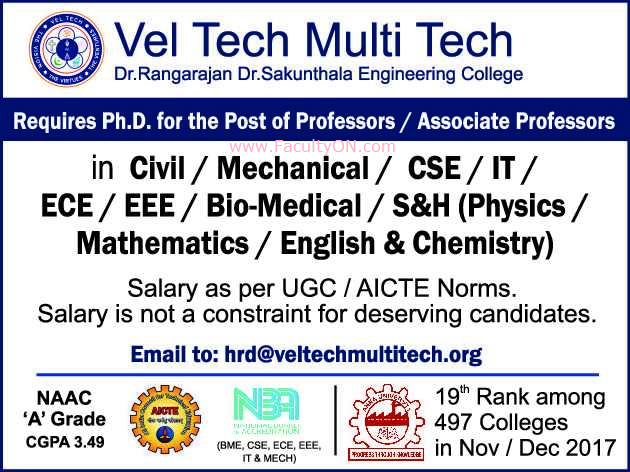 Vel Tech Multi Tech Dr.Rangarajan Dr.Sakunthala Engineering College, Chennai has advertised in THE HINDU newspaper for recruitment of Professor / Associate Professor jobs vacancies. Interested and eligible job aspirants are requested to apply immediately from 14th November 2018. Check out further more details below. About College: Vel Tech Multi Tech Dr.Rangarajan Dr.Sakunthala Engineering College one of the College under the Vel Tech Group of Institutions commenced its’ educational services in 1999. Today, it stands as a multi professional, research oriented, reputed and nationally recognized premier institute for its’ career oriented education. With an optimal blend of theory and practice, motive and desire, it offers 14 courses in Engineering & Technology including seven Post Graduate courses, leading to the award of B.E, B.Tech, M.E, M.Tech, MCA and MBA degrees of Anna University, Chennai.